Peter's Data Entry Suite ("DES") is a suite of well over 100 ASP.NET web controls designed around data entry. Its centerpiece is a replacement to the native ASP.NET validators that dramatically improves upon the original. It also includes data entry controls, controls that make your pages more interactive, and defenses against hacking. Its Peter's Business Logic Driven UI module ("BLD") allows sites to keep their business logic separate from the user interface. Peter's Data Entry Suite was first introduced in August, 2003 under the name "Professional Validation And More". Its controls are used on thousands of websites that require data entry, whether on an intranet or the web. Consultants have added it to their toolbox to greatly speed up delivery and address their customer's requirements. DES's users have posted extensive praise at third party sites. In fact, it has more 5 star testimonials on the www.asp.net Control Gallery than any other ASP.NET product. Useful: Built around data-entry, taking into account small details that make your data entry forms more effective. 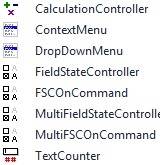 Second generation validation, the CalculationController control, the 4 FieldStateController controls, the MultiSegmentDataEntry control, ChangeMonitor, the Peter's Business Logic Driven UI module, and the entire Peter’s Input Security module. Support for ASP.NET 2 and Visual Studio 2005 through the latest versions. Peter's Data Entry Suite is sold as a Suite, containing all of the controls, or as modules, containing subsets of the controls. The modules are shown here. 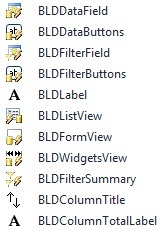 Use Peter's Business Logic Driven UI ("BLD") to keep your business logic separated from your user interface. It simplifies Web Form development by eliminating business logic code traditionally written into the Web Form. Instead, business logic is where it is preferred: in the Business Logic Layer. Utilizing technologies introduced by ASP.NET MVC and ASP.NET Dynamic Data, BLD gives you the tools to build your a Business Logic Layer and create the user interface that utilizes it. BLD's Web Controls read from the Business Logic Layer to establish validation, formatting, and a multitude of other features that belong in the Business Logic Layer. BLD includes advanced DataAnnotation attributes for your business rules and Data Access Object classes to build your CRUD for your business layer. It includes 25 Web Controls and a templating system to build a rich, flexible, and business logic aware UI. BLD fully utilizes the rest of Peter's Data Entry Suite, reducing the code you write for your data entry web forms. It is designed to be very expandable, with a well designed API and complete source code. ASP.NET comes with validators: controls which detect and report errors in data entry controls. So why do you need a replacement to them? Since ASP.NET 1.0 shipped, thousands of programmers have confronted numerous limitations with the validators forcing them to write custom code, hacks, or in some cases, drop a planned feature for their user interface. Peter's Data Entry Suite introduces second generation validation that is so feature rich, you rarely write any custom code, and it gives you compelling ways to add polish to your user interface. The Suite has 27 validator controls to cover most situations, of which 14 are in the Peter's Professional Validation module. Its ValidationSummary control, which summarizes the errors found, has numerous desirable improvements over the one that comes with ASP.NET. All of the validators provide extensive cross-browser support. The Peter's Data Entry Suite contains 27 validator controls. If you purchase individual modules, the Peter's More Validators module provides 13 of its validator controls. These validators are designed to handle more specialized situations like validating credit card numbers, word count limits, and duplicate entries amongst several fields. 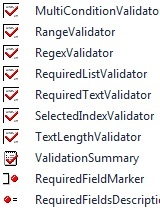 They have some of DES's most complex validation logic carefully implemented for both client and server-side validation. Peter's TextBoxes module provides 6 TextBox controls with client-side techniques to really enhance your user interface. It starts with a direct replacement for the TextBox supplied with ASP.NET that is loaded with new features. Plus there are textboxes for integer, currency, decimal, percentage, and filtered keystroke entry. Peter's TextBoxes also includes the MultiSegmentDataEntry control. It is like a power-user's masked textbox. MultiSegmentDataEntry uses multiple textboxes and dropdownlists to handle a single field that has a distinctive pattern, such as phone numbers, IP Addresses, and credit card numbers. You supply it with the text, it splits the text across its textboxes, handles filtering, auto tabbing, and validating. On post back, it reassembles the textboxes into your data value. Peter's Date and Time module provides 18 controls used to collect date and time oriented information from your users. Originally called Peter's Date Package, it is one of the most popular date and time entry solutions on ASP.NET web application today. 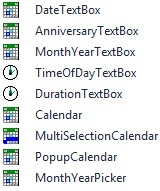 It includes a DateTextBox with popup calendar, a calendar that blows away the native ASP.NET calendar, a multiple selection calendar, two time entry textboxes, validators, and nine other controls. Peter's Interactive Pages provides 10 controls and 4 technologies. Hackers attack your web site through its inputs – data entry controls, query strings, hidden fields, and cookies – to access your database (called SQL Injection) and modify your pages with scripts (called Script Injection or Cross-Site Scripting). These attacks can be very damaging to a business, destroying data, exposing private customer information, or exposing customers to content that you would never want on your site. Validators play an important role in blocking these attacks. However, they have their limitations. Peter's Input Security introduces specialized Validators to detect and block attacks. It also provides a "best practices" framework to protect your site against attacks. Supports the CultureInfo object to localize these controls. This means it supports localized numbers and dates. Includes a string lookup system that permits localization of most textual properties throughout these controls. You use it to can define standard strings in one place, such as in a .resx file or database. Your controls will use the same text for the same situation, and you can change the text from one place. Uses TrueBrowser technology. That means it creates controls based on the real browser requesting the page instead of allowing the ASP.NET page to fool it with the clientTarget property. This guarantees the end user the best experience for their browser. With TrueBrowser technology, you can extend support to new browsers and those not previously tested. Style sheet driven. Style sheets are also compressed for faster transmission. Compatible with ASP.NET 2.0 and higher. It includes assemblies compiled for ASP.NET 2. ASP.NET 1.x users can use Peter's Data Entry Suite v4, which is still available. Compatible with Visual Studio 2005 and higher. Supports several AJAX frameworks including Microsoft ASP.NET AJAX and Telerik radAJAX. Can be adapted to most others. The documentation is extensive and detailed in Adobe Acrobat (PDF) format. Easy installation using the Web Application Updater program. It handles first time installation, service releases, upgrading, and converting native ASP.NET controls to their DES equivalents. Includes graphic images and style sheets to quickly give you a better looking user interface. Includes free Email and messageboard support, even if you are a trial version user. Object oriented software should not get in your way when you want to extend it. Both server and client-side code have been carefully designed, so when a feature is not built into this product, there are straightforward ways for you to extend this product. A free Developer's Kit with extensive instructions, an MSDN-style help file, and code samples is available. DES source code is available through a separate licensing procedure, but is free of charge. Peter's Data Entry Suite is sold as a suite, containing all of the controls, and as modules, containing subsets of the controls. Here are the product prices, shown in US Dollars. The types of licenses are described below. includes all modules $300 $1500 $2500 Reflects a 45% savings over purchasing all modules. Individual modules When purchasing 4 or more modules, it is more cost effective to purchase the Suite. Peter's TextBoxes $90 $450 $800 Recommended license: Peter's Interactive Pages, for Interactive Hints and Enhanced Tooltips. Peter's Date and Time $90 $450 $800 Recommended license: Peter's Interactive Pages to use Context menu and Help button features. Peter's Input Security $90 $450 $800 Requires a license for Peter's Professional Validation. Peter's Business Logic Driven UI ("BLD") -- -- -- Requires a license for the Suite or all of its modules. Trial Version - The trial version is free. It is the full Peter's Data Entry Suite with a license that expires in 30 days. Web Server License - Covers one production (live site) web server. All non-production servers including development and staging are covered once you purchase one Web Server License. As you add servers to your web farm, buy more. Once you reach five Web Server Licenses, you are automatically upgraded to a Site License! Site License - Covers unlimited production (live site) and non-production web servers. Choose this when you have 5 or more production servers. Redistribution License - If you are licensing your web application to your customers and it will be deployed on their servers, choose this license. This license also covers all of your own production servers like a Site license. Consultant License - This license is for consultants who want to keep Peter's Data Entry Suite in their toolbox so they are familiar with it as projects occur and can recommend it to their clients. It supports unlimited non-production servers including development and staging. It CANNOT be used on production servers. Your clients must still purchase the appropriate licenses shown above to use it on their production servers. This license is free and is the complete Suite. Click here to download your free Consultant License. Source Code License - The source code is available through special arrangement, but free of charge. It requires a valid Web Server, Site, or Redistribution license for Peter's Data Entry Suite or its modules. Please email Peter at PLBlum@PeterBlum.com to make the arrangements. In addition, this site contains demos next to the features it describes.